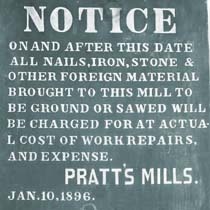 Check out our Facebook page for the latest news from the Sudbury Historical Society. Here are excerpts from some of our recent posts. Civics is back! In June 2018, the Massachusetts Department of Elementary and Secondary Education (DESE) adopted a new curriculum framework for History and Social Science, including a full-year civics education requirement for 8th graders. Additionally, after months of discussion and debate, a new project-based civics bill was passed by the Massachusetts House and Senate during the summer and is close to being signed by Governor Baker. In this spirit and because of its commitment to community engagement, the SHS will be piloting a civics enrichment program for 8th grade students that focuses on local government and democratic practices. Our Town will take 8th grade participants through the ins and outs of town governance, including the process of researching, drafting, and submitting a warrant article and marketing and voting on its adoption in a mock town meeting. Guest speakers from the League of Women Voters, current and former town employees and elected officials, and other guests with expertise relevant to the selected article topic, will discuss their experiences with participants and facilitators will share relevant documents and objects from the SHS collection for primary source use. The program, slated to begin in mid-October, will take place at least twice a month on a day and time to be determined by participants. Applications are available on the SHS's web site, or at Sign Up Link, and are due to the SHS by Tuesday, October 2nd. The program fee is $100 per student for the full academic year (need-based scholarships are available). 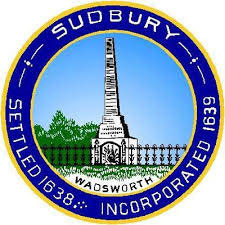 Contact Katina Fontes at president@sudbury01776.org for more information. 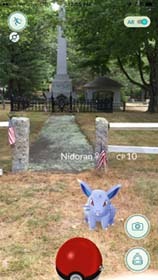 For an entertaining afternoon take either our audio tour of Sudbury Town Center or our driving tour of Historic Sudbury and see how many Pokemon are in residence at some of Sudbury's historic sites. 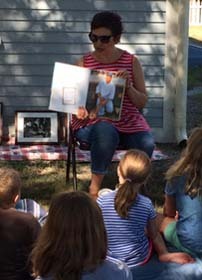 KIDSTORY: Katina Fontes talks to kids about Sudbury BaseballSudbury Historical Society, Inc. 2016Our Kidstory programs this summer have been a great success. Most recently we had a great time on July 27th learning about Sudbury's baseball history, including the great Babe Ruth! Mark your calendars for our next Kidstory program on Wed, August 10. The focus will be colonial architecture. Second Place in Family & Friends Division! 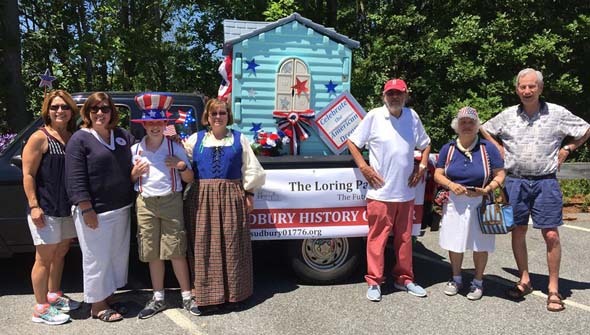 Second Place!Sudbury Historical Society, Inc. 2016The Society's float in this year's 4th of July parade was awarded the second place prize in the Family & Friends Division. Many thanks to Elin Neiterman, Jackson Hild, Beth Gray-Nix, Stewart Hoover, Ursula and Frank Lyons, and Jane Kline (not pictured) for all of their efforts to make the float and marching a success!